The Office of Foreign Assets Control’s (OFAC) sanctions regulations prohibit U.S. citizens, businesses and financial institutions from engaging in business or financial transactions with persons or entities on OFAC’s Specially Designated Nationals List (SDN list). In 2010, OFAC assessed fines and penalties in 24 cases totaling $200,735,996. Among those penalized were entities that extended credit, sold goods, or provided services to SDN List individuals.OFAC is actively investigating a number of auto dealers, along with other entities. What does this mean to your dealership? Hopefully you know the requirement to scan every customer you do business with against the SDN List, both cash and credit customers. If you’re relying on your credit provider to screen customers, or conducting manual searches of the SDN List, you could be leaving yourself open to violations. 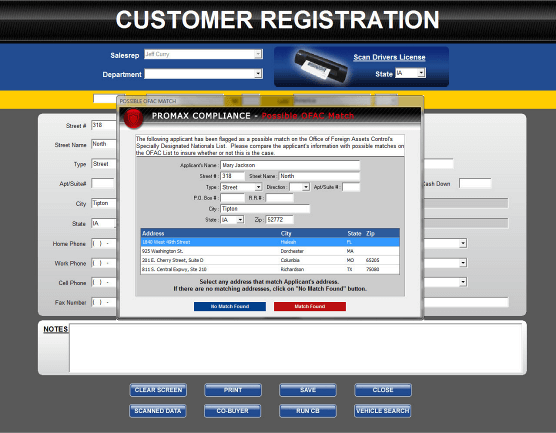 How the ProCredit OFAC Screen process works OFAC Scanning is automatic! Log all your ups with a swipe of a driver’s license in our Customer Registration Logging a customer from this scan initiates a OFAC screening. If there is a potential match, the user is alerted and given comparison data to review. Or use your current CRM and we will import the data into the ProCredit Prospect Log. Either way an OFAC check is done immediately at no charge! Since every customer is automatically scanned against the SDN List, nobody slips through the cracks!